Tired of waiting for customers to come in? 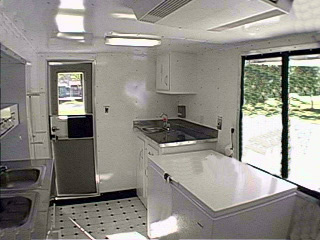 Assorted size exterior shots and interior shots of a 6 x 12. Click on a thumbnail above to see a larger photo or scroll down this page! 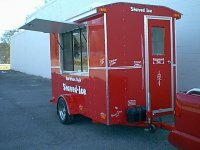 These high quality Shaved Ice concession trailers, with their well thought out floor plans, are designed to handle high volume sales and have been a hit with retail shaved ice vendors for many years. These trailers are ruggedly built and very economically priced. 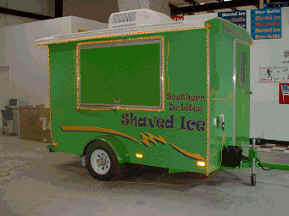 In fact, because of their quality and price, they're the only trailers we recommend! You'll be able to go where the crowds are and get your business off to a brisk running start. 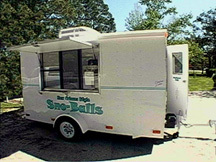 You'll also save a considerable amount of money as compared to buying from one of the national concession trailer manufacturers. We've listed a price and size breakdown below along with standard equipment, options and a special on equipment and supplies for your convenience. Prices subject to change at any time due to the rising cost of raw materials! Terms: Deposit is $1800.00 down to place a trailer in production if we don't have one to suit you in stock , balance due before shipping. All deposits are non-refundable. 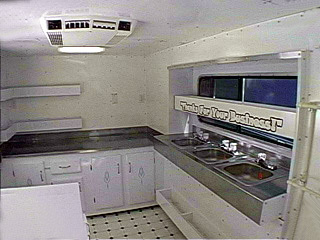 Trailer deal must be completed within 30 days of your trailer being finished or deposit will be lost. Even you can afford this one! Please keep in mind, the standard 115-Volt "house power" shaver motor will require an outside AC power source such as a generator to power your shaver. However many special events such as fairs and festivals provide standard electric "Plug-In" power along with your entry fee. FlavorSnow Shavers and supplies are extra. Trailer production times are currently at two to six weeks and can vary widely during peak season. 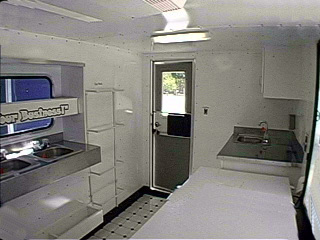 So it's important to send in a deposit so we can order your custom made trailer ASAP.